The same phrase comes from Julia’s lips days later, now from the San Blas neighborhood in Petare, while she breastfeeds her newborn son, drowned in the shrilling complaint of her second son, who’s not been allowed to benefit from her mother’s milk for the last fifteen days. “He’s hungry,” she says almost as an apology, her face twisted by the helplessness of a mother who can do nothing to ease his hunger. Adriana, her neighbor across the vereda, knows what she’s talking about. Her toddler was diagnosed with malnutrition. His muscles are weak and he suffers from a dermatitis all but worsened by cloth diapers. One case after another, right here in Caracas. The times when babies were born with an arepa beneath their arms is long gone. That Monday, Karina, along with four mothers in the neighborhood, looked rejoiced and nervous. Vivacious 8-year-old Brayan, her only son, briskly strode from the kitchen to the porch where children were gathering around four makeshift wooden tables. After the local elections in 2017, the community kitchen managed by Fundación Propetare and their program Alimenta la Solidaridad in a public building taken over by chavismo, was cleared out. Karina knew her community’s growing need and she wasn’t willing to look away. With the support of the foundation and her neighbors, she served 45 meals. Maite was there, her face relieved, waiting for the first meal her kids were going to eat that week. By 1:00 p.m., all the kids had eaten. Brayan ran up and down the stairs with his friends. Toddlers were returning home in their mothers’ arms. Maikel would be attending school with a full belly. Two weeks after starting the community kitchen, Karina and her allies now feed 71 kids between Monday and Friday. Alimenta La Solidaridad - Petare keeps six community kitchens which feed over 620 children and breastfeeding mothers in total, in the most vulnerable sectors. According to the Family Condition Survey, ENCOVI 2017, 51.2% of the Venezuelan population experiences multidimensional poverty and almost 1,000,000 children don’t attend school regularly for lack of food. 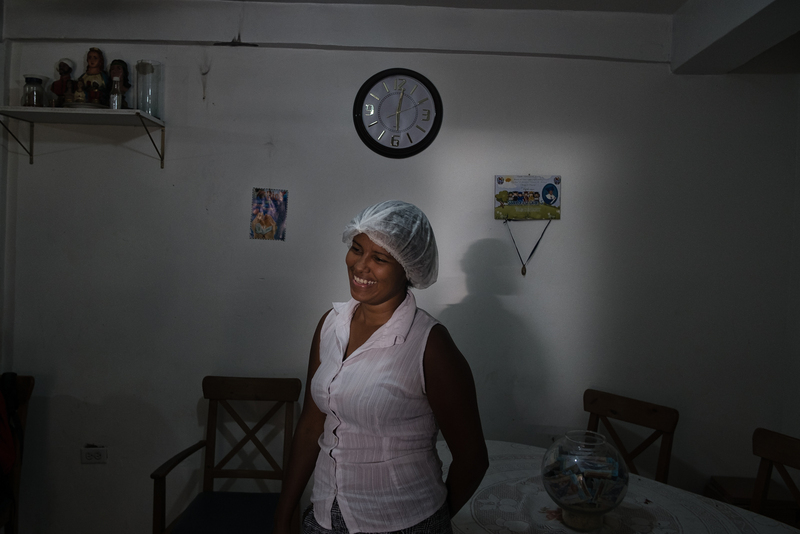 Adriana Lamadrid (30) shows her empty refrifgerator at her home. In the very heart of the Revolution, one in every three people lives in absolute poverty. Half their children drop out of school for lack of food at home. Hunger is a death sentence. We could all give in to hopelessness or, like Alimenta La Solidaridad – Petare, we could save a kid at a time, a meal at a time.